Im a big silver fan when it comes to decor. It just screams chic and it basically does all the work for you. I love mirrors as well. Mirrors in a room will always open it up and make it look bigger! 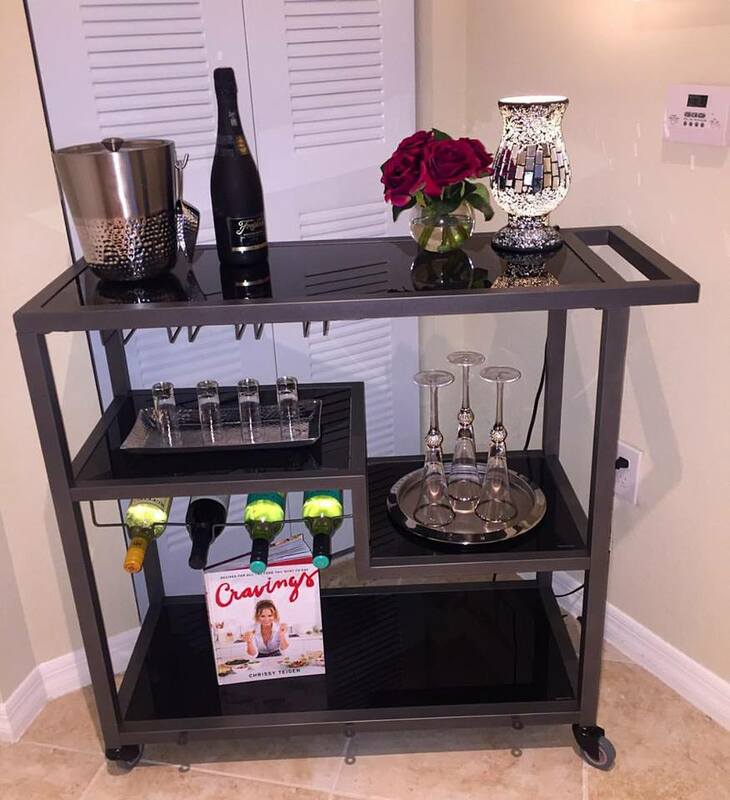 So for this Bar Cart, First things first..I had to fill it up with some WINE! My favorite… Nothing like coming home from a long day of work and pouring a glass of wine. I’m a white wine fan…I have 3 whites & 1 red stocked up! I also have a bottle of my favorite champagne! The silver/mirror plug in lamp is from ROSS! I couldn’t believe it. It was randomly placed on a shelf and I just couldn’t resist. I promise you…that store will be your best friend sometimes! Always keep an eye out! I placed a silver Ice bucket with Tongs to give the Bar Cart a real “Bar Cart” look. I placed a Silver platter to put my beautiful champagne flutes on the shelf underneath. I love these beauties so much. They are so GORG! They certainly make a statement! I broke one already 🙁 I need to go replace it. UGH can you imagine when i have little nuggets running around. I will have to replace everything with plastic lol MIRP. I stole my Chrissy Teigen Cook book from the kitchen and added it underneath on the bottom row to fill the emptiness just until I find something. I already have somethings in mind i just need to pick them up or get the delivered haha. BUT I LOVE HER!!! SHE IS THE CUTEST! Can Fall come sooner !! !